The common name of Helminthosporium is derived from the old scientific name for this leaf spot disease complex, which is actually caused by Drechslera, Curvulari, Bipolaris and Exserohilum species fungi. The disease cycle is generally short, as it requires extended periods of leaf wetness to develop and survive. ‘Helmo’ is caused by a common and serious group of diseases, attacking a diverse range of warm and cool season turf grasses. ‘Helmo’ can severely reduce the aesthetic appeal of the turf grass and can lead to the need for turf replacement. Helminthosporium can attack turf under a wide range of temperatures between 3°C and 30°C, with optimum range between 15°C and 18°C. It favours high humidity and therefore thrives under conditions of extended wetness in the leaf canopy. 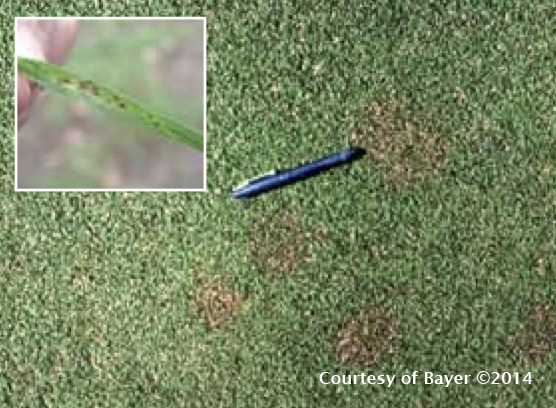 The symptoms of Helmo turf diseases vary, depending upon the specific pathogen, grass species, weather conditions, and cultural conditions involved. In general ‘Black Helmo’ produces small dark spots or patches of dead of dying grass (melting out), which do not measure more than about 10 cm in diameter. Leaf tissues turn yellow around these lesions and in severe cases the infected plant dies. Helminthosporium disease is distributed throughout a wide range of climatic conditions.